Look lively ‘cos the bloggahz are coming. For the last couple of weeks we’ve been busy contemplating some of the loveliest products on the counters (aren’t we always?) before tasking BuyaPowa with the mission to offer them up for less. Rising admirably to the challenge, the co-buying initiative have declared this week; Blogger’s Week! Each day will bring new products as put forward by various bloggers on the interwebz. I’ve included a full list of bloggers and products below, so if you’re liking the look of any of them, don’t forget to sign up to make sure you’re notified as soon as the co-buy goes live. 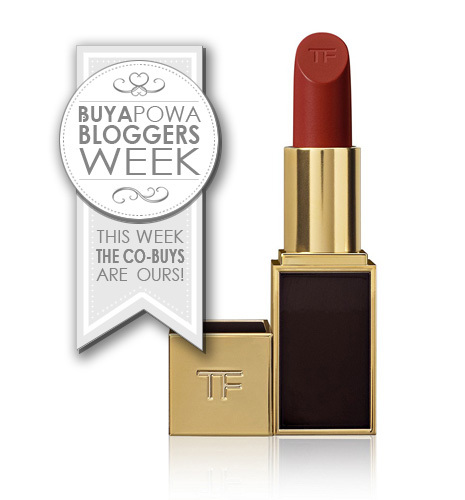 Choosing my ultimate BuyaPowa co-buy was pretty easy once I’d decided to go down the lipstick route! The Tom Ford Lipstick in Scarlet Rouge combines my passion for a great red lip with the benefit of having a few pennies shaved off the retail price. Hooray for posh red lipstick! What do you think of the blogger choices, are there any you’ll be going for? What would you have chosen?! I don’t think I’ll be able to resist the Urban Decay 15th Anniversary palette at Buyapowa price! Same here! And will be keeping my eye on the Benefit mascara too! oh no im in trouble, already obsessed with buyapowa, now im gonna be worse! and i want everything especially marc jacobs daisy, and chanel blush! Just checked and your co-buy choice is now live! I’m happy to see NARS Laguna Bronzer on that list as I was just talking about buying it. I think this was a nice idea as there are some real blogger’s favourites in there. What’s interesting is that I don’t think I’ve ever seen brushes on buyapowa. I’m not sure if there’s a reason for that but it would be the thing I’d choose for a co-buy. How annoyed am I that I just recently bought the Chanel blush full price. Im a fan of they’re real mascara and I’m off to check out swatches of the lippies. I do not need another eye shadow pallet, so hopefully I can resist the UD one, but blush is another weakness…….. Wish you guys were doing it every week! When are they going to make this available in the States? So jealous! !